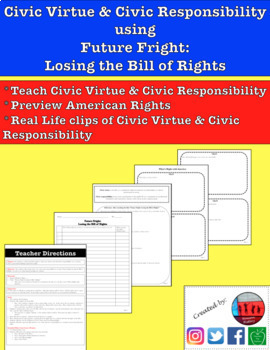 Students will learn and reflect upon the importance of Civic Virtue & Civic Responsibility when they view a short 25 minute fictional film that shows an America that has lost its Bill of Rights (Future Fright: Losing the Bill of Rights). This hook to your Constitution unit engages students to discuss what their rights are as American citizens and brainstorm what they would do if the events were happening in America today. Following the first half of the film is a second 20 minute part that highlights specific people who help to show "What is Right in America". 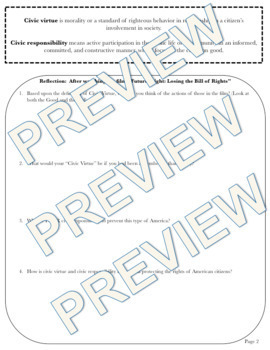 The extension segments are also included in the student handout with reflection questions. The film is found on Youtube with search of "Future Fright: Losing the Bill of Rights" or "What is Right in America"
If you have ANY questions, please send me an email, and I will be happy to help! *If you enjoyed this product, please look for the "FOLLOW ME" green star near my store's logo and click it to become a follower. You will be the first to see new products and future sales. *How to get TPT credit: Please go to your My Purchases page (you may need to login). Next to each purchase there is a "Provide Feedback" button. Click it and you will be taken to a page where to give a rating and leave a comment for the product. Every time you give feedback, TPT gives you feedback credits that can be used on the cost of future purchases.